Image Size: 27 X 17 in. 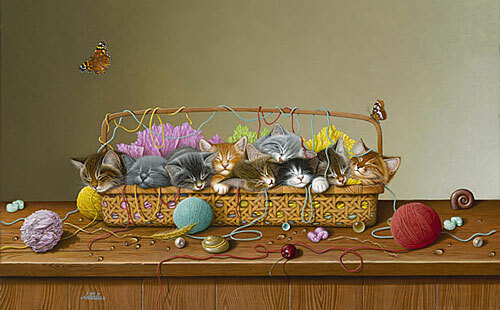 This litter of nine lives is sleeping off a busy day spent gathering and assembling their own version of kitty litter. Painted to perfection by our fabled fashioner of felines, Braldt Bralds, you'll find among the colorful tissue and leftover packing peanuts an assortment of other items purr-loined from his previous puss paintings including tissue from Bag Ladies, pearls from Boucat and packing peanuts from Siamese Twins.